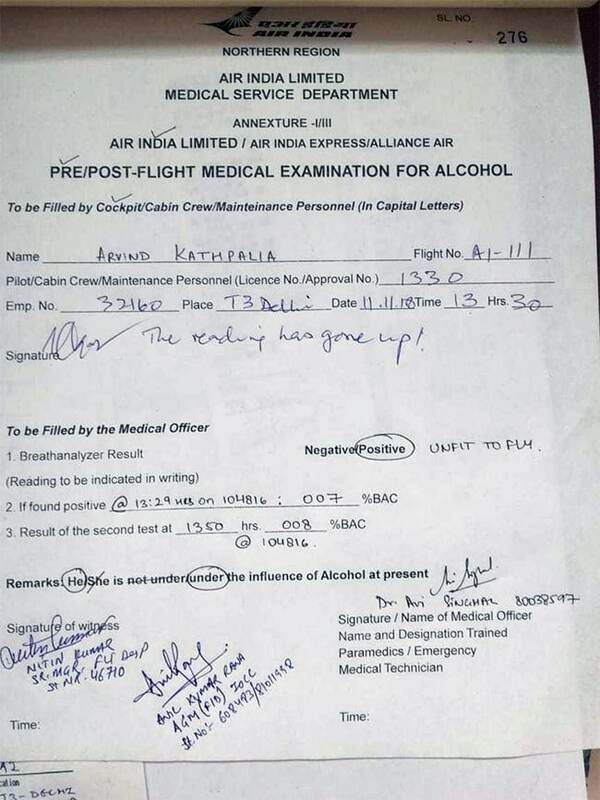 Senior Air India pilot Arvind Kathpalia was grounded after he failed the breath-analyser test. The Air India AI 111 Boeing 787 Dream liner flying to London was delayed as the pilot was found unfit to fly. The passengers were left stranded for almost an hour at the Delhi Airport. “He was given another chance but the second test was also found positive following which he was grounded”-official. According to rule 24 of the Aircraft Rules, it prohibits crew member from partaking any alcoholic drink 12 hours prior to the commencement of the flight. According to other Air India sources, captain A K Kathpalia was known to be a repeat offender. 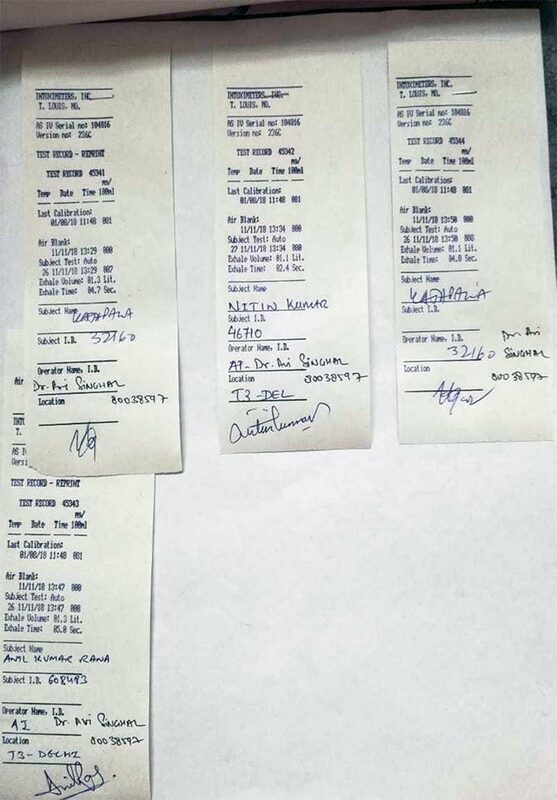 In the year 2017, captain A K Kathpalia was suspended for three months for skipping the mandatory breathalyzer test. According to reports, the court directed Delhi police to lodge an FIR against him for violating aviation rules, tampering with evidence and intimidating a doctor employed by Air India. The flight was scheduled to take off at 2:45 this afternoon. “A few minutes after the tests were completed and I was sitting for the pre-flight briefing in the next room, the doctor came and informed me that the test conducted in her presence was found positive. When asked why she didn’t tell me right then (earlier), she said something was wrong with the machine and it was taking time to register,” Captain Kathpalia told a reputed news agency. The pilot said he then went to a private agency for a blood test, the results of which will take 48 hours to come. Captain A K Kathpalia was previously appointed as executive director of operations. The decision of appointing captain A K Kathpalia as the executive director of operations was further challenged by a pilots association in the Delhi High Court. Captain kathpalia was soon removed from the post of executive director of operations but was later appointed as the director of operation in Air India Limited for the next 5 years. The Directorate General of Civil Aviation (DGCA) has passed a law stating that any pilot who fails the breathe analyses test must be suspended for three years. In an unrelated incident, another Air India Dreamliner – AI-332 – took off for Bangkok from New Delhi only to be called back after it was found that the co-pilot had missed his mandatory pre-flight breathalyzer test. According to airline sources, the pilot has been grounded for three months, during which he will undergo a refresher counselling session. “A pilot is assumed breath analyzer-positive even if he has forgotten to take the test before the flight,” a senior executive said. Also read: Airports and Airport Jobs – Your destination awaits!